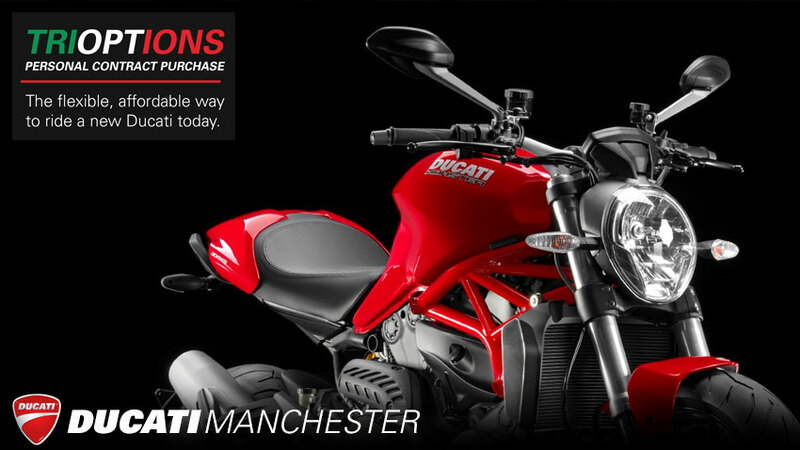 In association with Black Horse Ltd, Ducati Manchester are pleased to offer TriOptions Personal Contract Purchase – an affordable* option to ride your new Ducati. TriOptions is available on all models from the 2016 range and finance figures are subject to change. The above example is representative at the time of publishing.Ducati has constantly reacted to customer needs by not only producing market challenging products but also by making our motorcycles more affordable. This has been done by reducing service costs, extending service intervals and by offering a range of Ducati Personal Contract Purchase options that make the dream of riding a Ducati a reality. For further details and a bespoke quotation please contact Ducati Manchester today. * With a PCP product a significant proportion of the total amount payable is payable at the end of the contract by one large final repayment, so your regular monthly payments are low. The Representative Example shown above is based on an annual mileage of 6,000.
Credit is subject to status and is only available to UK residents aged 18 and over. This finance offer is only available through Ducati Finance, a trading style of Black Horse Ltd, St. William House, Tresillian Terrace, Cardiff, CF10 5BH.